Deadline Approaching for Abstract Submission! 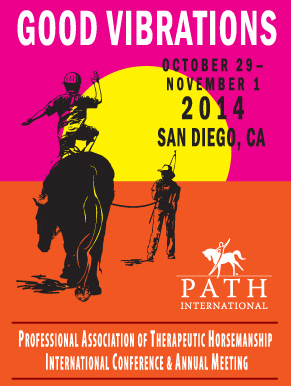 The deadline for submitting an abstract to present at the 2014 PATH Intl. Conference is March 14, 2014, 11:59 p.m. MDT. Click here to submit the completed abstract submission form. For many people, the awards banquet is the highlight of the PATH Intl. Conference and Annual Meeting. It is a time to celebrate the achievements of the talented equestrians, the outstanding instructors and equine specialists in mental health and learning, the hard-working equines and the dedicated volunteers and veterinarians at PATH Intl. Centers. Now is the time to recognize their efforts and submit an award nomination for these special individuals and animals. Nominations are due no later than 11:59 p.m., MDT, May 20. Click here for information and for the fillable forms. a veterinarian answer for you? Last Month's Results: What other industry associations do you belong to? Thanks for responding to our first "Burning Question of the Month"! The results were very enlightening: 19% of respondents belong to AHA, 16% belong to CHA and 12% belong to EAGALA. The most reported association was AQHA with 26% of respondents belonging. The American Paint Horse Association rounded out the top 5 with 11%. USEF and USDF tied with 7%. Nominate your favorite PATH Intl. Center to win a Gypsy horse! Visit GypsyGift.com for details and to submit a nomination today or visit their Facebook page to vote. Now that you have found a new horse for your PATH Intl. Center, what should you do next? Click here to read suggestions and considerations. Check out these PATH Intl. Member Benefits and receive discounts on products and services. Click here for the Member Benefits page (you must be logged in). Members of PATH Intl. receive a 10% discount on all membership plans for Equestrian Professional.com, the Horse Business Site. Center administrators especially should take a look at their offerings! PATH Intl. Members receive a 15% discount all year at DressageClinic.com, an educational website offering complete training videos of international dressage trainers, riding and lecturing on their horses in training. Use discount coupon code PATH4DC.